"Child Safety 24 / 7"
Here's another free resource for parents from one of the world's leading expert on self-protection and personal development training. In this information-packed report, Shidoshi Miller gives you proven strategies for helping your child to be more safe in Today's often unsafe world. ...to significantly increase the odds in your favor. 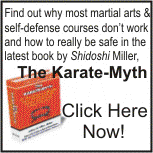 Should I Consider Martial Arts? Safety Tips and Strategies for Taking Action - Right Now! To download your free report, simply complete this short form and click to submit. That's it. In a few minutes you'll be reading this powerful report and gaining additional insights into the world of self-defense and child safety.